Hey, Guys! Today I am going to tell you about How to Hack Trail software easily for the lifetime. Many of the times you might be using any applications on your PC. Some of Those are trial software. It means you can use this software for 30 days trial period. I will explain you all possible ways about how to remove trial period from software. After that, you have to pay the application for the license of the software. Then it depends on how much the application costs for the license key or how to buy the application? Today I am going to tell you about the application in which I will tell you how can you hack that software. Previously, We was shared a Guide on Top Apps for rooted android users. In Below Steps, I will be telling you 5 methods which you can try. Then you can easily patch this application. Now, whenever you install any applications on your computer. Then there is a registry file available in the application which is saved in your registry files. That this application has been installed at so and so date and the time. Now when the date of the application will be complete for example software is 30 days trial. Then you will get a pop-up about the application. It is now not working and you have to buy the license key of the software. Also have a look at Things to Do After rooting your device. I will also explain you about how to remove trial version software from registry in easy way. for enjoy video calling with friends. If you don’t want to buy the software then you can simply follow those below 5 methods. Then you will be able to do those settings. There are some applications that will clear the application registry files. Clearing the registry files is good. If you don’t want to clear those registry files then you can simply edit the registry files by a simple software easily. Get Complete info on how to remove trial period from software, now from below with 5 easy methods. #1 – Hack Software By Using RunAsDate Application. Now, the software is called as RunAsDate. Runasdate is the software which will help you out to run the trail software for the next given time. The software is easy and simple. Run as date is having the best interface and really simple a lot. You can also make any software as trail version for some more days easily with the help of this application. 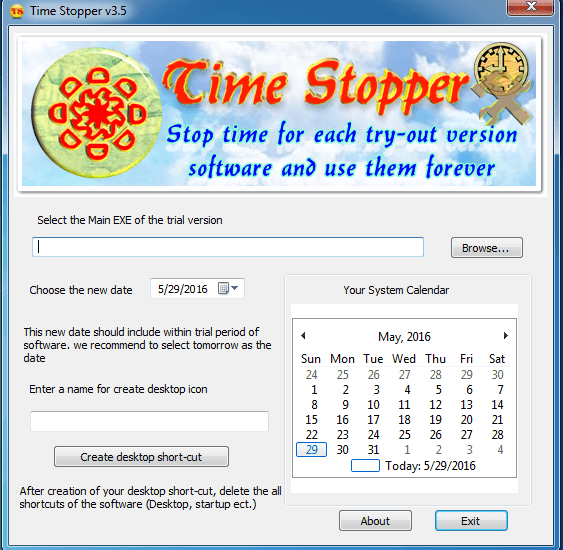 You have to time stopper software free download from below, and use in your PC. This application is running in almost all windows 7, windows 8 and windows 8.1 and windows 10. This application is also running absolutely fine in Windows XP and vista. You can also call it time stopper software, checkout more about this now from below. After that click on the date and select the date at which you have installed the software on your device. Now, simply click on Create a shortcut and name the shortcut and you are done. 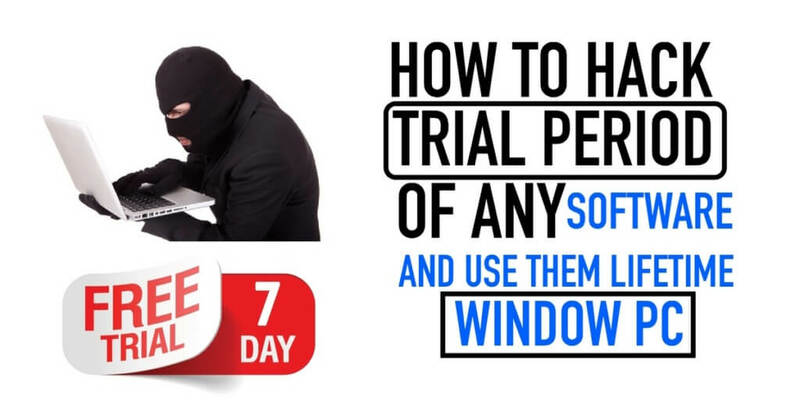 This was the simple method to Hack any trial software easily with the help of this software. 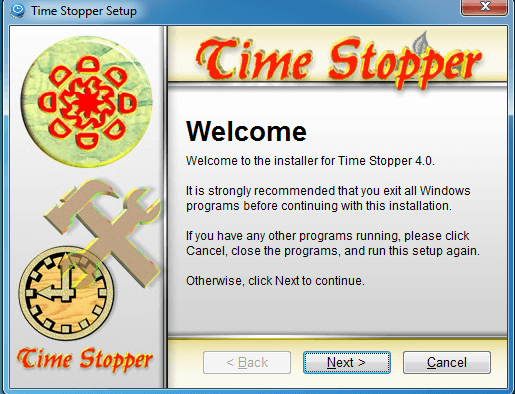 #2 – Hack Software By Using Time Stopper Application. Time stopper is the application which helps you to use the trial software forever. This application stops the time of the software so that it will show the same date and time every time so that software will think time is stopped. You can use the trial software forever with the help of this application. It is really a good application which you can give a try. If the application trial period is already stopped, then you cannot run this application on your Android device. For know more about how to use trial software again, simply follow the easy steps now from below. Set the date of tomorrow if the date is today 29 so select date 30. Now, create a shortcut and named it by your name and you can open the application from the given name shortcut only. Now, you have stopped the time of the application and you can enjoy the application forever. This application won’t expire. Absolute uninstaller is the application which will uninstall the application from your computer. This will clear all the files available on your PC and then you will be able to install the apps easily. Because the registry is clear from the application. Let’s check out the example which you can try. For how to use trial version software forever without expiration, you can use uninstaller method which is mentioned below. Suppose you have installed IDM in your computer and now your application is asking for the key. Just because it has been expired. In this situation, you can try uninstalling the application. It will clear all the registry files which say this application was installed in so and so time and date. Then you can easily install the application on your computer. This is an easy process which you can try on your computer. If none of this software given above didn’t work. Then you can try simply uninstalling the windows and installing again. Most of the times users don’t have money or they don’t have the debit or the credit card. They can simply try this trick to get the another 30 days trial of the software. For know more about how to make trial software last forever, read full steps now from below. If any of the above methods didn’t work on your computer but this will work absolutely fine. You will lose all your data by following this trick. If you don’t know how to format your computer then you can simply follow this below video method. Many of times you use any software, there are patches available which actually patches the application. If you will Google once about the application you will get the patch of the application easily. Most of times you will get this patches on torrents. If you don’t find any application then you can simply follow the above tricks on your PC. This is very easy and you can do those settings. There are read me files available while following this patching of the application. This was the article about How to Hack Trail software easily for the lifetime. If you face any difficulty while following any of this method feel free to comment below. Thank you for visiting and keep visiting viraltecho for more tips and tricks. As always peace out. Can i hack quickheal total security??????.? ?